For crafty Harry Potter fans, throwing a party themed to the stories can be the ultimate DIY labor of love. A great excuse for throwing a Harry Potter party is coming soon: the Nov. 16 release of the franchise's latest movie, "Fantastic Beasts: The Crimes of Grindelwald." Online instructions can help you make stuffed or sculpted recreations of the movie's magical beasts, including Nifflers and Bowtruckles, and the main character's creature-toting suitcase is inspiring cakes and decorations. * Add glue layers to one end of the stick or rod to build up a handle, stopping to dry if too drippy. Tip: Stand the stick upside down in a glass while drying. * Add glue in rings, dots, swirls or knobby bumps. Attach embellishments. * Once the glue hardens, paint half the wand, and let it dry. Then paint the other half. Try metallic colors or wood tones. But want-to-be witches and wizards don't need excuses to put a Harry Potter spin on kid and adult birthday parties, quinceañeras, brunches, housewarmings, gender reveals for expected babies, bachelorette festivities, movie-watching marathons and Christmas get- togethers. Additions to the vast online trove of Harry Potter craft ideas keep coming, even though the original book series ended about 10 years ago. You can draw messenger owls on white balloons with notes attached, make wands from carryout chopsticks and hot glue, and create "floating" candles with battery-powered lights poking from toilet paper rolls painted white. The candles, with drips made of glue, hang overhead on hard-to-see plastic string to imitate an enchanted ceiling at Hogwarts School of Witchcraft and Wizardry. At Debra Hawkins' party for her daughter's 8th birthday in Lehi, Utah, she stuffed small, brown, construction-paper witch hats with candy-coated chocolates in green, red, blue or yellow to represent the colors of Hogwarts' four student houses. Kids tore into the hats to reveal their house assignments, a riff on the stories' Sorting Hat ceremony. "You can do a Harry Potter party completely from scratch and make absolutely everything yourself, or you can find all the things that other people have done and roll with it that way," says Hawkins. "That's the really nice thing about so many people loving Harry Potter: There's just so much out there." Harry Potter ideas and tutorials are one of the biggest draws to Angie Jensen's crafting blog, Jonesing2Create, beating out her Star Wars party posts, she says. To keep a party manageable, veteran planners suggest choosing just a few crafts. Jensen focused on activities rather than perfect goody bags or decorations. "I'm not a Pinterest mom," she says. "If I'm not having fun anymore, then I'm out." For a version of the wizard sport Quidditch, she made pool-noodle brooms and attached Hula Hoops to plastic plumbing tubes stuck in her California yard. To make a Dementor piñata, she taped a treat-filled paper bag on top of a pool noodle with Halloween prop hands attached. A black shirt covered the noodle, and a black skirt served as the Dementor's cloak, hiding the bag. The supplies cost $3. "That was a super-easy one," she says. Hawkins hung stone-patterned paper on the walls for a Hogwarts Castle feel and affixed potion labels made by her designer husband on thrift-store bottles filled with colored water. She shares the labels on her blog, Housewife Eclectic, along with other printable files, including paper house ties and Hogwarts acceptance letters. Many graphic designers and hobbyists offer free or inexpensive downloads, including Platform 9 3/4 signs and labels for licorice wands, chocolate frogs and other wizard candy. For an adult viewing party of the first "Fantastic Beasts and Where To Find Them" in 2016, Hawkins focused more on decorations and snacks. But even adults wanted to participate in a house sorting ceremony, she says. She made mini Sorting Hats by pressing chocolate chews into cone shapes and then putting them on cupcakes filled with colored candy. Selah Hovda of Phoenix used supplies from around the house and shopped early for deals for her son's 8th birthday party. She made a papier-mache Sorting Hat with a cereal-box base for about $5, passing up one that cost about $50 at a store. 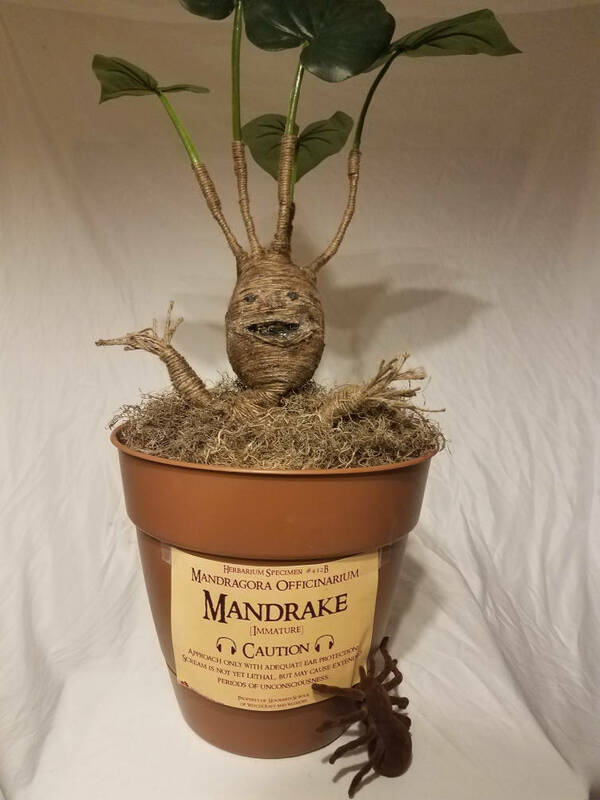 And she created a version of the screaming Mandrake plant from plastic foam wrapped in twine with fake green leaves. "Dollar Tree is my best friend," she says. Her son enjoyed making wands for favors, adding bits of yarn and pipe cleaners to dowel rods and painting his creations. "He thought it was pretty cool because he was able to put his own little flair on that," she says. The wands were guests' favorite. "All night they were having little battles," she says.